Designer Lanterns are made of terracotta and iron. We are offering our client an excellent quality range of Lanterns. These Lanterns are manufactured from qualitative range of raw materials. 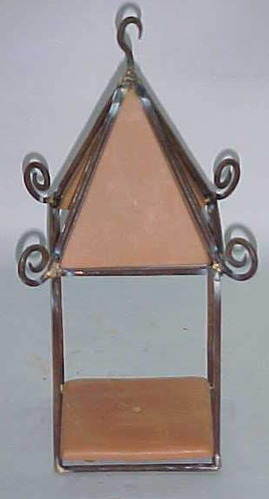 These Lanterns are offered in variety of designs, shapes, sizes and colors. Our assortment of Lanterns is available at most competitive prices. We are looking queries only from foreign countries. We are a young and dynamic enterprise engaged in Manufacturing, Supplying and Exporting a comprehensive array of Handicraft Items like Bathroom Accessories, Steel Bathroom Set, Decorative Bathroom Set, Stainless Steel Bathroom Set, Brass Bathroom Sets, Bathroom Set, Metal Bathroom Sets, Bird Bath, Bird Feeders, Bottle Stands, Aluminium Bowls, Candle Holders, Candelabra, Table Coasters, Metal Cuff Rings, Door Knockers, Ear Rings, Flower Vases, Hanging Items, Designer Metal Urn, Designer Metal Lamp, Hanging Lanterns, Designer Ashtray, Metal Baskets, Decorative Bookend, Designer Metal Boxes, Designer Galvanised Buckets, Garden Watering Cans, Christmas Items, Designer Clock, Door Mat, Fire Pit, French Pot, Garden Items, Decorative Hooks, Ice Bucket, Designer Iron Lantern, Mail Boxes, Designer Brass Menorah, Antique Mirror Frame, Napkin Ring, Picture Frame, Decorative Galvanized Planter, Designer Iron Platter, Pot Holder, Decorative Rack, Stocking Holder, Designer T-Lite Holder, Designer Metal Trivet, Antique Water Tub, Umbrella Stand, Antique Decorative Urns, Wall Sconce, Wine Cooler, Wire Products, Brass Cremation Urn, Brass Flower Vase, Designer Flower Vases, Copper Flower Vases, Metal Flower Vases, Aluminium Candle Stand, Brass Planters, Wooden Pillar Candle Holder, Copper Bath Tubs, Decorative Lantern, Square Planters, Iron Planters, Decorative Planters, Designer Urns, Galvanised Planter, Metal Lanterns, X-Mas Tree, Steel Candle Lanterns, Iron Lanterns, Wall Lantern, Iron Trays, Garden Stick, Garden Sundials. This entire range of products is widely demanded in the market for its innovative designs, excellent craftsmanship and eye-pleasing color combinations.We are looking for foreign query from all over the world. Our team of skilled and creative artisans hold expertise in bringing alive these magnificent piece of art. Their artistic brilliance enables us to offer the clients with absolute masterpieces in a multitude of designs, color-combinations and patterns. All these products are crafted using Eco-friendly and safe material. We also provide this series of products in a wide range of customized options in terms of designs, color-combinations and patterns to match with the interior decor of home or office. This entire collection of masterpieces exhibits a touch of classy craftsmanship and artistic excellence due to which, it is widely demanded across Indian and international markets.